When Alachua Farm & Lumber in Alachua, FL opened our doors in Alachua’s old packing shed, right at the foot of historic Main Street in downtown Alachua, our family had one goal, “Keep Country Life Simple.” We’re proud to say that we’ve been able to honor that goal for more than 30 years by giving you exactly what you need – a huge selection of country living supplies, friendly service and total convenience. 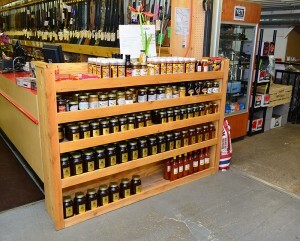 From sporting goods and apparel to farm supplies and hardware, we have it. Our granddaddy taught us the importance of a strong work ethic, and we’ll always do what we can to make sure that we work harder than anyone to provide great service in an honorable way. That’s why since 1984, we’ve succeeded in supplying North Central Florida with everything from unique, hard to find items to all that other stuff you’ll find at supersized chains. Heck, we probably have more stuff than the big guys! Whether you want to go fishing with the family, hunting with the boys or do some improvements around the house, we’re your one-stop shop. In addition, having served so many generations of customers, there’s a pretty good chance that we know what your family likes and we’ll make sure that it’s in stock and ready to go for your family’s enjoyment. The bottom line is that if you’re from Gainesville, Alachua, Jonesville, Newberry, High Springs, Starke or anywhere else in North Central Florida, and you’re looking for the very best in hardware, hunting, animal care, archery, livestock and pet care or equestrian supplies, you’ll want to visit Alachua Farm & Lumber today. Shop our store for hunting supplies, guns, ammo and other sporting goods today. Feel free to call us if you are looking for a specific item. We also accept AFL Gift Cards and Lay-Away (90 days).